The culmination of last year’s PvD boat party saw Paul van Dyk rock the good ship Cream Ibiza and go from ‘decks to deck’, crowd-surfing the length of the ship. Now, one year later, PVD is back again with Cream Ibiza for another sunset cruise on Thursday August 1. As part of the brand’s birthday celebrations, the Cream Ibiza boat party weighs anchor from San Antonio harbour at 6pm on August 1 and sets sail towards Es Vedra. Soundtracked by the music from Paul van Dyk’s forthcoming, ‘Politics Of Dancing 3’ album, the boat will cruise eastwards around the ancient rock quarry of Atlantis - a place of high reverence for hippy Ibiza. 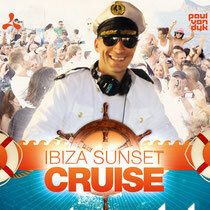 As the sun begins to slip beneath the Mediterranean waves, PvD will pay musical homage to the legendary Ibiza sunset. After the three-hour tour, it’s time for Cream Ibiza's birthday party at Amnesia with Paul van Dyk, Eddie Halliwell, Gareth Wyn and Rob Harnetty in the Main Room.